Nine MSU students participated in the Sense of Site Workshop. 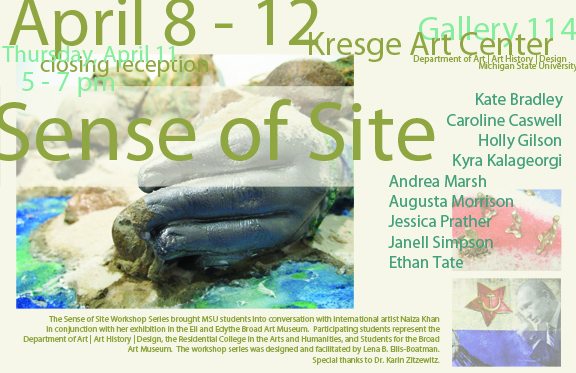 Their artwork was shown in Gallery 114 in Kresge Art Center, 600 Auditorium Rd., East Lansing, Michigan. The closing reception was held Thursday, April 11, 2013, and is featured in the slideshow below. For each artist’s statement and images of their work addressing Sense of Site, please select a name from the list beneath the slideshow.